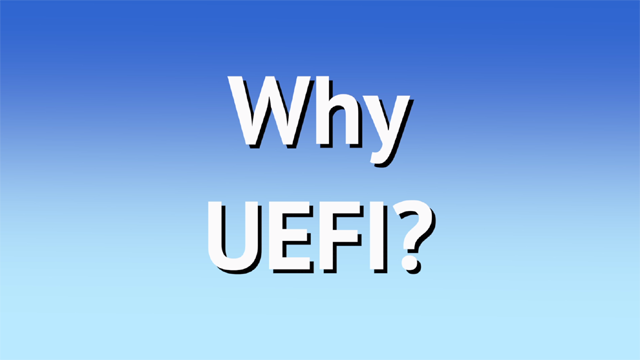 UEFI is a replacement for the original BIOS that's been running computers for almost a quarter of a century. UEFI allows manufacturers to take advantage of the security capabilities of the machines they produce. Well, I'll tell you, but if all you want is the answer, then you completely missed the point of the question. Continue Reading: So Just Why Are Manhole Covers Round? In order to prevent malware from replacing critical system components with compromised copies, Windows works very hard to maintain the integrity of the system files on your machine. If you try to replace one of the "protected" files, you may get a message that the operating system has put the old approved version back. That's "Windows File Protection", now called "Windows Resource Protection". Unfortunately, there are occasional ways around system file protection. Sometimes it's as simple as a hard disk error causing a system file to be damaged and become corrupt. As a result, automated checking is nice, but sometimes you need to take matters into your own hands. Continue Reading: What Is the System File Checker, and How Do I Run It? I'm writing this on the last day of a trip taken to the Netherlands to visit relatives. As planned, I decided to play a little with a couple of my Microsoft accounts (aka Hotmail or Outlook.com accounts) to see if I could duplicate what so many people seem to experience: getting locked out while travelling abroad. I didn't get locked out. Why I didn't run into problems is pretty simple: I was prepared. (Though I also think something else played a part for at least one of my accounts; more on that in a moment.) But I can see how a lack of preparation can end up with accounts inaccessible until you return home. Let's review exactly what I mean by "preparation", and how you can avoid getting locked out of your Microsoft account when you hit the road. I'll also touch on why Microsoft takes these additional security steps. Thanks Leo for your insight and suggestions. I respectfully suggest that Microsoft (MS) get it's act together and implement a new function in downloading updates either automatically and/or by personal design. To wit: Before MS updates are downloaded it have a built in an automatic function to implement a system back up file before the update is installed. Then if a problem occurs afterwards we can simply keep going back to an earlier saved backup to fix or await the resolution to a problem in downloading a MS update. To remember to undertake a daily system back up manually as you suggest is just not feasible to an individual not as astute in such manners as yourself Leo. Thanks for being there & if possible in your tech language, make this recommendation to MS for all of us. It should be very simple for MS to do, automatically. God bless, and have a safe life, it's more important to surfing the web. Actually that'd be a great idea, but then they'd have to make sure you had enough disk space, warn you if you did not, and also provide a mechanism for rolling back to that backup. Seriously, I think it'd be great, but it's not trivial or easy. Anyone can set up a daily backup. I have articles and books on exactly how to do so. That's exceptionally important regardless fo Windows 10 updates - so many things can go wrong. Amen Brother! Have had nothing but problems after the latest Win 10 update. Unfortunately I trusted Windows auto update and failed to do a backup prior. Live and learn! Several commenters have mentioned this but I think it needs to be stated explicitly. The article talks about how long you might *want* to keep several types of backups, but its the capacity of your backup media that determines how long you'll *be able* to. Backing up to DVD or tape is a pain, but it can't be beat for long-term retention. When you're out of media you just go to Staples and buy more. But when you're backing up to disk, you have to consider how many full and incremental backups the disk can hold. If your backup device holds ten times as much as the disk(s) you're backing up, that puts an absolute limit of ten on the number of full backups you can keep. Or, depending on your change rate, a smaller number of full backups and some incrementals. A 100 GB system which is probably less than many of the people reading this have would take about 20 DVDs at a cost of about $6.00. 10 of those backup sets will get you a 2TB external hard drive which will hold 20 backups. Less time less cost, a more stable backup, and you can reuse any of the disk space when you determine you no longer need any of those backups. I'd go for the extra drives.